While Bethesda has done a fine job developing the fiction of the continent of Tamriel, there's one important story missing from The Elder Scrolls V: Skyrim — yours. And what good is a tale that goes untold? We want to know how you fit into the lore of Skyrim, and we're not above sharing it with a few thousand of our close friends. It's fan fiction, but it's okay when it's Skyrim. 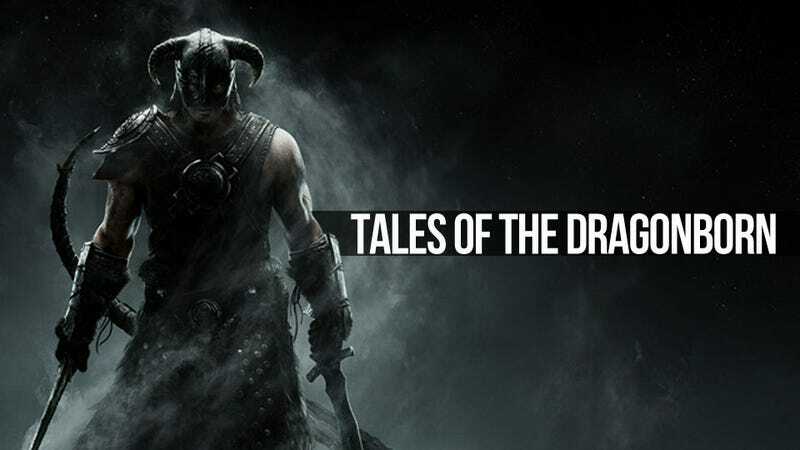 We've all got stories to tell, whether it's just a few short sentences of character development to help flesh out your particular Dovahkiin or a lengthy bardic composition honoring a particular heroic span of your unique adventure. This is a game that develops differently for each player, so comparing experiences is the only way to fully appreciate all it has to offer. So bring us your odes, your short-stories, your bawdy tavern tales and your adventure journals. Each day next week we'll be chosing one to be showcased on the front page of Kotaku for all the world to see. My life-long dream is finally within my grasp. I am going to join the Imperial Legion. I didn't realize this was my life-long dream until a few days ago, when that lovely man helped me escape from Fort something-or-another when the bloody great dragon attacked. I could tell he was fond of me the way he hesitated when the armored woman ordered me executed. The way he beckoned me forward, singling me out from the gathered criminals, the come-hither way his eyes scanned the prisoner manifesto, eager to know whatever he could about my name and appearance. "I'm Emily the Nord," I told him. Were my hands not bound by strong rope I would have flirtatiously run my fingers through my short-cropped raven hair. Sparks flew, and not just the ones given off by the smoldering ruins left after the mighty lizard unleashed its fiery breath. He could have left me to die. Instead he cut my bonds and led me through a series of underground passages, killing any ne'er-do-wells that dare interrupted our time together. The closeness was almost more than I could bear. Oh yes, and we killed a bear. And to think I almost missed this due to my dragon-halted beheading. Once we reached the surface he led me to his village, introduced me to his father, and said the sweetest thing I've ever heard. "You think about joining the Legion. We could use a strong arm like yours." It was as if destiny tapped me on the shoulder and told me to pay attention. "What?" I asked. He repeated himself with the mock annoyance that comes with familiarity. Suddenly it all made sense; I *would* make an excellent legionnaire! I've always wanted to wear plate armor and swing a sword about in long, graceful arcs, and mother always said I had a real knack for oppression. I used to oppress anything I could get my hands on as a child; other children, house pets, furniture, dead leaves. "You've not been oppressed until you've felt the cold steel heel of Emily the Legionnaire!" I could tell by the way he was staring at me that I had spoken out loud, and if that bewildered look was any indication, he liked it. So much so that he immediately gave me a recommendation for the commander of the Legion in Solitude and bundled me out the door of his home. He also gave me an important message for a town called Whiterun, something about a dragon. I crumpled that up and tossed it away. How was I going to deliver a message to a town? "Hello, town. Here's your message." "Thanks Emily the Legionnaire, you should stop by and oppress me sometime!" As I chuckled to myself I realized the commander of the Imperial Legion in Solitude was staring at me, and that I'm not very good at chronological storytelling. Driven by my newfound life-long dream I made a beeline for Solitude, stopping only to gather some colorful flowers, oppress a couple of wolves, explore a cave filled with disgusting undead creatures, and buy a fancy hat. The Imperial Legion loves fancy hats. Oh yes, and I killed a dragon and earned the magical ability to shoot concentric circles from my mouth, so there's that. "Are you listening?" the commander of the Imperial Legion asked. "FUS!" I replied, grinning impishly as concentric circles sent papers flying everywhere. "Yes, very nice," said the commander of the Imperial Legions at Solitude, who was probably named something very dashing, like Leoric. "As I was saying," Probably-Leoric continued, "You cannot simply walk in here and demand to be made a legionnaire. We require our new recruits perform a service before being welcomed into the ranks. What we ask of you is...first, stop taking off your clothes." "We ask that you travel northwest to Fort (I wasn't listening) on the coast. It's been overrun by bandits, and we wish to reclaim it. Do this for us, and your dream..."
"...your life-long dream will be realized." That was all I needed to hear. I grabbed my axe, a handful of fire (never leave home without it), and my best oppression outfit and set off for Fort (it could be anything, really). The northern coast of Skyrim is characterized by a large number of sheer cliffs that don't react well to being oppressed. The rocks at the bottom, however, take it like champs. Four days into my hour-long journey I finally stood at the gate to Fort (it has something to do with snow or cold, I'm sure of it), cursing Probably-Leoric-But-Maybe-Sir-Darviathar (so cool) for not providing me with a map or splints. Maybe some of those climbing things, what are they called? Crampons. "Crampons!" I shouted in response to the challenging war cry of the particularly menacing-looking brigand charging towards me wielding a giant hammer. The crackle of lighting arcing across the fingertips of his mage friend and the distinctive thwip of arrows being fired in my direction covered my volcabularic indiscretion, but there was just the hint of a smirk on the hammer holder's face that just would not do. No one smirks at a (prospective) member of the Imperial Legion! It was oppression time. I stood up straight, swung my axe menacingly, and lit my hand on fire. "You..."
Did you know it is possible to get hit so hard with a two-handed hammer that everything slows down and goes all third-person? I wouldn't recommend trying it yourself, especially while wearing steel armor. Thieves! It's been my life-long dream to be a thief! And that, my friends, is why I stick to non-fiction. Think you can do better? I know you can. The comments section is yours.